Managing a business is not for the faint of heart. It’s a commitment that requires endless time, passion, devotion, and work. Whether it’s a restaurant or a grocery store, there are various things that you need to have in line in order to remain a successful business, and one of those is pest control. Pest control is necessary for all commercial spaces, regardless of the focus or how you’re utilizing the space. Earthwise Pest Mangement has been fortunate enough to work with various businesses in the Sacramento and surrounding area. Through our commercial pest control services, we help business owners ensure that their spaces are free from the pests that make their job all the more stressful. Keep reading for a few of the reasons that all commercial spaces should have a reliable and efficient pest control professional on their payroll. The customer is always right! This is a saying that’s gone back for years, and it’s not going to change any time soon. While pests may not relate directly to the opinion of the customer, they do contribute to your ability to retain customers. The moment that a customer notices a pest in your building, they’re done. Very rarely will customers who have taken notice of pests continue to utilize that service, shop at that store or stay at that hotel. There’s simply something unsettling about knowing that there are pests in the space that makes it impossible to return to. Rather than let that be the case for your business, you can ensure that you’re taking all preventative measures to reduce the chances of pests showing up at all. In a world where the internet rules all, the last thing that you want is a bad review. As we mentioned before, a customer, patient or patron that notices a pest in your building is sure to spread the word. Very rarely do they keep this type of information to themselves. When it’s a restaurant, hospital or hotel that we’re talking about, the chances of a bad review are all the likelier. The major downside to this point is that pests can be taken care of, but reviews last a lifetime. Even if you take care of your pest problem after the review has been written, it’s nearly impossible to alter or remove a poor review. Rather than try to defy the odds of the internet, invest in some quality pest control services and avoid bad reviews altogether. The customers make up a portion of the individuals that are visiting your space, but they’re certainly not the only ones. The people that will be spending the most time in your commercial buildings are your employees. While pests can make enjoying your business difficult for customers, we guarantee that it is drastically more unenjoyable for your employees. Keeping up on pest control and preventative measures ensures that your employees are in a safe workspace and that they aren’t exposed to various types of pests. Aside from that, no one wants to work in a place that is combating the day to day struggles of pest infestations or the circumstances that they leave behind. It’s been proven that spaces that prioritize pest control solutions in an attempt to create an enjoyable workspace for their employees experience higher retention rates. This is great for customer loyalty and building a team that knows you care and is eager to provide you with the same respect in the work that they do. The best part is, this is something so simple that you can do for your team while also helping your business and improving your business in the eyes of your customers. Not every business is going to have regulations that they need to uphold, but more often than not there is some type of bar that is set in regards to the cleanliness of a business. Some of the businesses that come to mind in regards to regulations and standards are hotels, restaurants, schools, and hospitals. All of these businesses have specific standards that must be met in order for them to be open to the public. While some of these businesses may not have legal regulations to follow, there are immediate4 repercussions when they are not met. Hotels, for example, don’t have any organization telling them that they’re not allowed to have bed bugs, but you can guarantee that the customer basis is going to fall immediately after word gets out that there’s a bed bug problem. The same can be said about restaurants. When there’s as much food available as there is in a restaurant, mice could easily become a problem. Many customers know that this is a challenge that restaurant owners will combat, but it’s also one that they expect them to have a handle on. No matter how understanding a customer may be, they’ll never be understanding enough to experience a rodent problem and let it slip. Rather than let that happen at your restaurant, take preventative measures and make sure that it’s never a problem that you have to worry about. Now that you’ve seen all the benefits of utilizing a high-quality pest control company, it’s time to book your services. 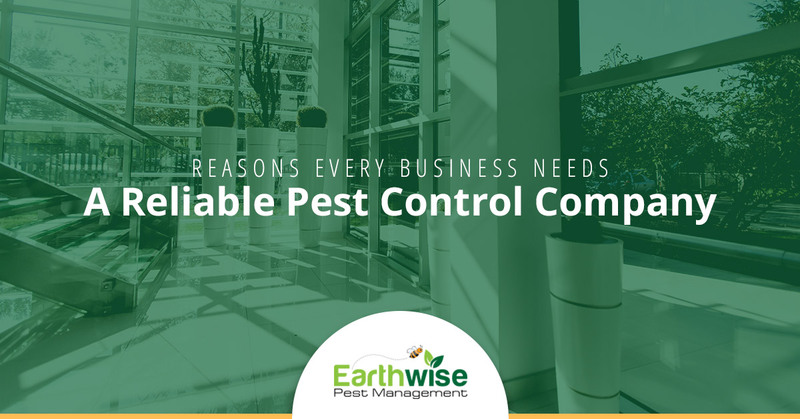 Earthwise Pest Management has years of experience working with commercial buildings and the pest control problems that they’re prone to. Contact our team today for a free consultation on your space! When the pest control professionals that make up our team inspect your space, they’ll take into consideration all of the factors that may have attracted the pests there in the first place as well as the severity of the pest control issue itself. Once we’ve acknowledged these factors, we’ll provide you with a plan of attack and help you get it scheduled. We will also provide you with a list of recommendations on repairs and items that you can do to minimize the chances of pests in the future. Don’t wait any longer, call Earthwise Pest Management today and get your commercial space taken care of!